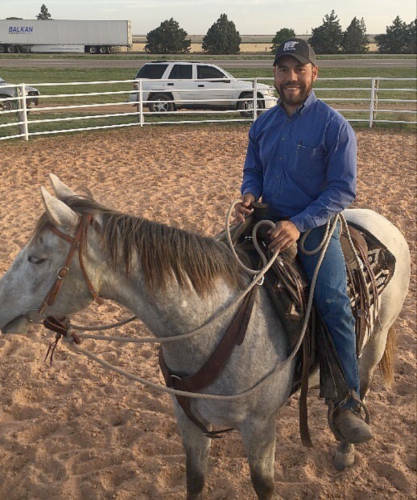 Eric Bailey, an assistant professor in the Division of Animal Sciences and a state beef Extension specialist, grew up on large, corporate cattle ranch in eastern New Mexico. The ranch was made up of more than a million acres and was split into three divisions. Each of the three divisions was home to separate units. Bailey’s father was responsible for one of the units. With rough terrain and long miles to cover, Quarter Horses were the most reliable way to travel from place to place. Bailey continues to ride and train horses after years of doing so. With nearly 130,000 acres to look after, the Bailey family needed reliable transportation to check the more than 1,500 head of cattle they were responsible for. The family turned to American Quarter Horses. That meant Eric Bailey got acclimated to horses at a very young age. Having a strong comfort level led Bailey to begin training those horses, something he continues to … Expand ▸Having a strong comfort level led Bailey to begin training those horses, something he continues to enjoy. Bailey practices what is termed natural horsemanship. Rather than force the horse to submit, natural horsemanship focuses on working with the horse’s behavior patterns. Bailey, an assistant professor in the Division of Animal Sciences and a state beef Extension specialist, grew up on a large, corporate cattle ranch in eastern New Mexico. The ranch was made up of more than a million acres and was split into three divisions. Each of the three divisions was home to separate units. Bailey’s father was responsible for one of the units. With rough terrain and long miles to cover, Quarter Horses were the most reliable way to travel from place to place. “Quarter Horses have the perfect mix of stamina and muscle,” Bailey said. “They’re also gentle minded and good-natured. They’re great for riding but they can also provide some of that horse power. Having a strong comfort level led Bailey to begin training those horses, something he continues to enjoy. Bailey practices what is termed natural horsemanship. Rather than force the horse to submit, natural horsemanship focuses on working with the horse’s behavior patterns. Bailey begins by getting into the horse’s flight zone, meaning he gets close enough to the horse to make it uncomfortable and feel the need to move. When Bailey wants the horse to stop motion, he backs away from the flight zone. After the horse is comfortable with a saddle or blanket on its back, Bailey attempts to have the horse reach a comfort level with him on its back. With a passion for teaching, training Quarter Horses was a natural fit for Bailey. When Bailey joined Mizzou, he took advantage of the Equine Teaching Facility at the South Farm Research Center, in Columbia. Bailey had two horses that found a home at the facility. “I like to find project horses that have fallen through the cracks,” Bailey said. “It’s exciting to give them a good start. I enjoy buying project horses and giving them a ranch education. Bailey has served as a guest lecturer for Crosby’s equine training course since he joined MU. While Bailey sold his two horses this past May, he is looking at getting back in the game.